One of the best ways to reduce household expenses is to experiment with different homemade glass cleaners. These natural cleaners are simple to make and typically call for ingredients you already have in your pantry. By making homemade glass cleaner you not only save money, but you also do your part to preserve the environment. Compared to standard store-bought glass cleaners, homemade versions drastically reduce the amount of harsh chemicals released into atmosphere. The reason is that most homemade glass cleaners don't contain high levels of toxins that are featured in most brand name versions. Fortunately, it is easy to reduce the spread of air contaminating pollutants by making glass cleaners from scratch. Homemade cleaners are just as effective on glass as store-bought ones, plus, since you are reusing the spray bottle over and over, you are reducing the amount of waste your household creates. When it comes to making effective glass cleaners at home, the most important ingredient to have on hand is vinegar. The simplest natural glass cleaner recipe calls for one part white vinegar to one part water. The vinegar will not only remove soap scum, hard water, mold and mildew from glass, but it also helps kill germs and bacteria without leaving behind a nasty residue. What's more, vinegar is non-toxic, so you don't have to worry about it harming the environment. If you want the vinegar-based cleaner to leave a pleasant scent, then simply add a few drops of dish soap to the mixture. Another effective natural glass cleaner is made from one cup of water, one cup of isopropyl rubbing alcohol, and one tablespoon of white vinegar. The rubbing alcohol and vinegar will evaporate as they clean, so you shouldn't have a problem with streaking. 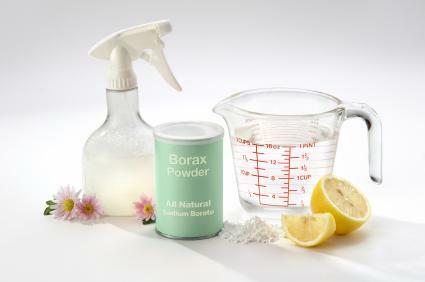 If you are dealing with extremely dirty glass, then add two tablespoons of Borax to the aforementioned recipe. Borax's mild abrasive action and natural deodorizing properties will allow you to clean glass surfaces without scratching them. For cut glass, sprinkle Borax on a damp rag and clean glass with gentle, even strokes. Rinse with clean water and polish with a soft cloth. Finally, you can also clean dirty glass with a mixture of rubbing alcohol, non-sudsing ammonia, and water. This stronger version of standard homemade cleaners will make glass sparkle and remove any unwanted grease, grime and dirt. When making any type of homemade cleaner, especially one that will be used on glass surfaces, it's important to take a few safety precautions. For example, when storing glass cleaners you make yourself, be sure to label the spray bottles clearly and keep them out of reach of children. Also, you should never mix ammonia with other powerful household cleaners, such as bleach. The combination can create toxic fumes. Finally, when making homemade glass cleaning recipes, use common sense. Avoid getting the solutions in your eyes and don't saturate your hands with the cleaners.